I moved my house in March this year. I need to find a tailor in the new neighborhood, to modify the waist of skirts and pants hidden in the closet for days and emerging just because of house moving. Fortunately, I found one tailor shop with an old aunt running it. It does not have high charge, but it has some other challenges for me. As a professional to improve corporate business processes, these issues are absolutely unacceptable on one hand and on the other hand, resolvable. Therefore, I put up my professional spirit and convinced the tailor to let me help her get out of the messy situation, for free. I gave myself one month to challenge the task of transforming a local tailor; such a mission impossible. Her challenge is that she is always too busy to get order done on time. From revenue point of view, tailoring itself cannot make ends meet; her main income is from re-renting part of the house. Her pricing structure is very simple; normal orders are starting from 6 dollars and will be delivered at least one week later based on the complexity; urgent orders charge 2 dollars more and will be delivered within one or two days. She prefers to take urgent and simple orders, which does make sense. We have 3 tailors around this area, with similar charge. Range of income for majority of the residents is low-to-mid, with higher percentage of aged people. Generally, normal orders do not have much space for higher charge. Therefore, my focus is more about process and efficiency; how to do more with less. I spend sometime in the tailor shop, to observe how she is working and her interactions with customers. I also did sort of interview; because she is very old (close to 70), we cannot have structured QnA as I planned; what I can do is to follow her story-telling and draw some valuable input. As always, issues here are not too difficult to spot; what I have experienced in the past few days has been re-confirmed. 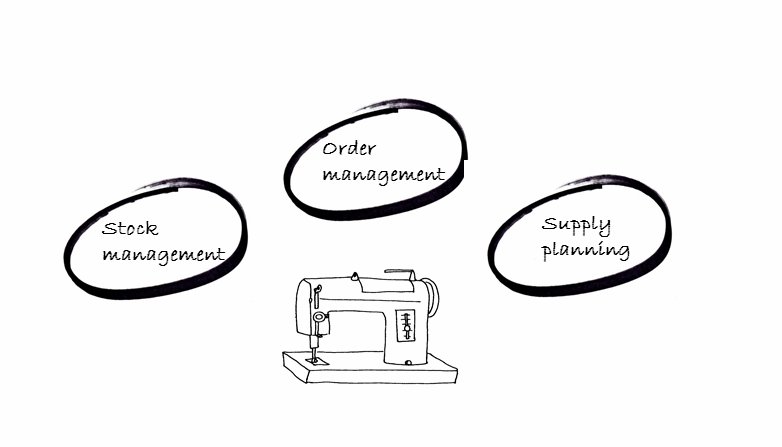 In complex corporate environment, we have system to support order management. To understand it, normally we ask questions like how many orders, when to take, what information to capture, how the order is translated into demand, and how the order status is monitored. She has a paper order book. It’s normally captured when customers bring in cloth to be modified. It has basic information like Due date, Customer Contact, Requirement. One order has 2 copies, one is for customer, and the other is attached to the cloth. Different pieces of cloth from one order are put into one bag so as to be tracked easily. Order here serves as contract, demand, and status tracking log. In terms of order volume, generally, every day she gets 4-6 orders, among which 1-2 order are urgent; and 2 out of one week’s orders are very complex and can take 4 hours or more, the others normally take 1-4 hour. However, she only taken order manually and use the above paper document on a whim. If she is busy or familiar with the customer, this step is always by-passed. Without any note, the task easily interrupts all the other on-going work, or even gets forgotten somewhere. She needs to pay special attention and effort to get it done. Another part is orders sometimes are not captured completely, without due-date, customer contact, and requirement. Similar to no order, those incomplete orders are easily to be buried till customers’ visit or took special attention out from Aunt. Yes, we need to talk about Demand and Supply balance here. It’s to determine production and supply plan by looking at demand on hand and available resource. Tailor aunt does not have regular helper (sometimes, yes, for special family reason); basically, she is the only resource and her available hours is almost fixed. Demand here is relative stable; even we can see demand is going up over weekends and festivals. Tailor aunt understands the importance of planning, but she never practiced it regularly. There were no weekly or daily task arrangement, no weekly or daily order review; her work either focuses on the urgent orders or is driven by expediting from customers’ visit. Order might stay there forever if no one drops in. Besides, no plan means no direction; it’s common for her to jump between tasks and such back-and-forth actually is effort-taking. Therefore, she is constantly busy without knowing what is for. Every warehouse people for manufacturing can tell you basically how many types of stock we need and why we need them: Raw material, WIP (work-in-progress), Semi-finished goods and Finished Goods. If everything is messed up, they will be just busy with finding things. Clear stock structure can also help us easily sense the overall operation picture. For the tailor shop, basically, we have similar item (order) structure. However, similar issue like order management, it’s never strictly followed; item 3-5 are always mixed with each other; too many pending orders due to lack of basic information or frequent jumping between tasks. Therefore, it’s normal for her to take quite some time every day to find things. Enforce the order taking procedure. No order, no work. Enforce the item stocking rules with clear sign-boards. Restructure the “Order to be started” area (which is actually a big shelf) with upper side for order to be delivered within next week; and lower side for order to be delivered after next week. Weekly review for orders to be started. Rearrange their stock locations. Daily planning for orders to be delivered on current day and the day after. Introduce 2-day rolling schedule board with order number, complexity (easy or complex) and status. Besides, a space is left only for urgent orders. The purpose of the 2-day rolling board is to guide her how to spend the time, monitor the status and it can also help her to propose due-date at the time of order taking. Since urgent orders are more profitable; ideally, every day we should leave 1-2 hour blank for urgent orders. I try to make it to the tailor place in the evening every the other day to help the tailor to review status and do work planning. The first 2 rules look simple and I can see the difference since I started; but every visit of mine would still capture some exceptions. I help her for the weekly review and re-arrange stock; however the challenge is with orders constantly being delayed and item without order document, such a practice does not make much difference. 1-3 are input accuracy, and 4 are output functionality. The first assumption is not valid within the one-month practice. Urgent or normal item has been constantly by-passing order-taking procedure which means there are no order number, customer contact, easy-to-read requirement and due-date. They keep jumping into the picture after my visit. To dealing with the fact and enforcing the planning practice, we start to use logo in the bag to differentiate those orders, later change to color of bag or cloth. The second assumption never works, either. How could you blame a 70-year old lady for leaving something in the area it’s not supposed to be? The third one is never easy to follow and therefore, the plan is just seating there, getting no valuable input and providing nothing about guidance. It’s always easier said than done, especially for a 70-year old lady. Should I change her mind-set? Maybe Yes, maybe No. We cannot say she refuses change because all the habits are staying there and they might have been working fine; her ways of working does make sense from her point of view. Should I do something different? I give it up to do any change after some open discussion with the tailor aunt. She told me that renting part of her house is already able to support her daily life, her requirement for the tailor shop is not about making money or efficiency; it’s just a place starting from her parents which can remind her that she is still not too old. We are still friends; I still go to her for dry clean and cloth modification, but I change my expectation a little bit. I stop picking up my cloth as per the agreement, but postpone the visit for 1-2 weeks. I am not so demanding as to require an order document because I start to trust her to keep it well. It’s not a success story judging by the output; however, the lesson learned in my view, echoed well with all the operation issues as well as those delivered or failed transformation journey. Kick-off a project does not guarantee the determination for a change; without taking the leap to try things differently and the risk of failure, no concreate achievement can be made. What is more important, mindset change requires us to ask WHY and find the coming exciting reward with the change. Those steps are missed in my mini project. We tend to want to do more but more always leads to complexity and confusion. I try to make things simple; however, adding all those new tools and ways of working are still complex for someone who has kept all the existing habits for 50 years. A better approach could be one thing at a time here. I used to be proud my professional skills to deliver change; my secret is just to set up milestones and deliver the milestones. They are unfortunately missed in the brand-new context. Without milestones, we cannot measure what we have achieved having only a vague vision. Besides, without milestones to show us the visible quick-win, it’s very easy to give up because the frustration of going nowhere.